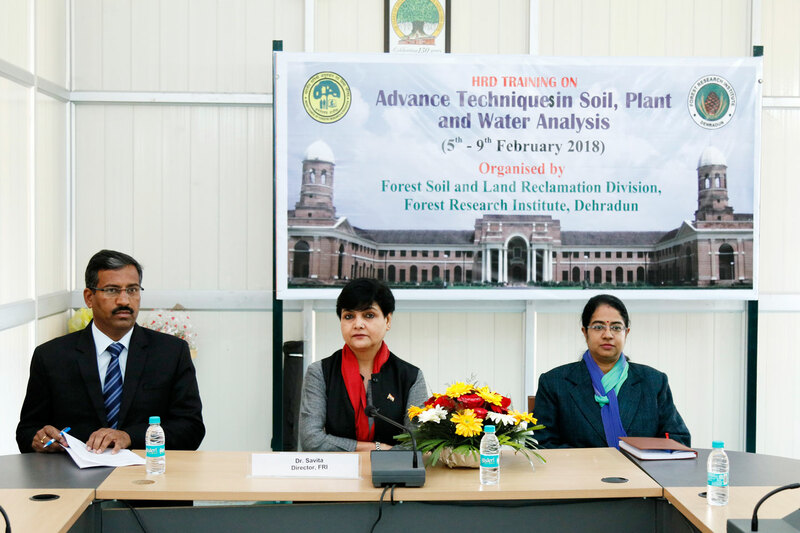 Forest Soil and Land Reclamation Division, Forest Research Institute, Dehradun organized a training programme on “Advance Techniques in Soil, Plant and Water Analysis”, for Research Support Staff of ICFRE Institutes from 05th– 09th February, 2018 at FRI, Dehradun. Indian Council of Forestry Research and Education (ICFRE), Dehradun sponsored 12 Technical Officers and Staff from various Research Institutes of ICFRE under Human Resource Development Program. The main objective of this training was to develop skill and new techniques for laboratory analysis and to enhance the knowledge base and work efficiency of research staff. Because the supporting research staff is a back bone of research with Scientists of ICFRE institute working in various project of recent trend in different field of soil, water, climate change, and many other rehabilitation work in the institute across the country. ICFRE expects that the trained trainees will function more effectively by getting exposure from the information, concepts and techniques learned in soil, water and plant analysis. Soil, water and plant analysis testing is an indispensable tool for research, advisory services and pre-requisite for giving recommendations, as well as designing appropriate soil management practices. Dr. Savita, IFS, Director, FRI was Chief Guest for this occasion of Valedictory ceremony of the training program and distributed certificates to the participants for their successful completion of training. She addressed the participants to implement what they have learnt from the training on “Advance Techniques in Soil, Plant and Water Analysis” for this challenging environment which is continuously degrading in many ways. Dr. V. P. Panwar, Head, Forest Soil and Land Reclamation Division gave the welcome speech for valedictory ceremony and told that how the participants/ research support staff of ICFRE Institute had learned new things for implementation in their work skill. Dr. Parul Bhatt Kotiyal, Course Coordinator of this training programme conveyed the vote of thanks to participants, Chief Guest, all Head of Division, FRI, staff and officers of Forest Soil and Land Reclamation Division, FRI, Dehradun for their presence and support for organizing this training programme.